Our Absinthe is bright lemon, fresh orange are topped with white jasmine and sensual musk. This fragrance is phthalate free. 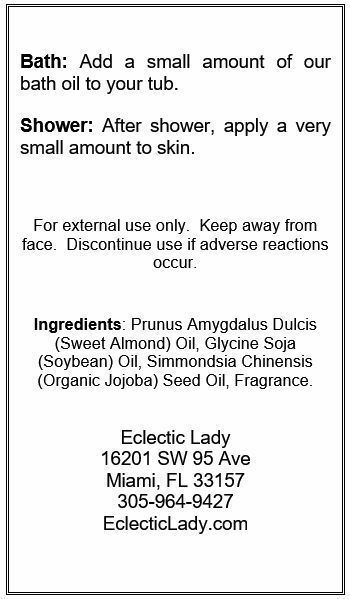 We use sweet almond oil, jojoba oil, and soybean oil as the base oils for our bath oils. Sweet almond oil and soybean oil are superb moisturizers. Jojoba oil is very similar to the oil your skin produces. Preservative Free Dye Free Phthalate Free Ingredients: Prunus Amygdalus Dulcis (Sweet Almond) Oil, Glycine Soja (Soybean) Oil, Simmondsia Chinensis (Jojoba) Seed Oil, Fragrance. Eclectic Lady specializes in custom-made home, bath and body products. Our products are handmade to order in micro batches. Everything is fresh and made especially for you.